ONLY 54,344 Miles! Sunroof, Full-Time 4MATIC All-Wheel Drive, Turbo Charged, Dual Zone A/C, Smart Device Integration, Alloy Wheels CLICK ME! Full-Time 4MATIC All-Wheel Drive, Turbocharged, iPod/MP3 Input, Onboard Communications System, Dual Zone A/C, Smart Device Integration MP3 Player, Child Safety Locks, Steering Wheel Controls, Electronic Stability Control, Heated Mirrors. PREMIUM PACKAGE KEYLESS-GO, Garage Door Opener, Compass, Heated Front Seats, SIRIUSXM Satellite Radio, Auto Dimming Mirrors, harman/kardon Sound System, AMG DRIVER & PASSENGER PERFORMANCE SEATS power adjustment w/lumbar support, PANORAMA SUNROOF, BLIND SPOT ASSIST, BLACK ASH WOOD TRIM, WHEELS: 18" TWIN 5-SPOKE ALLOY (STD). 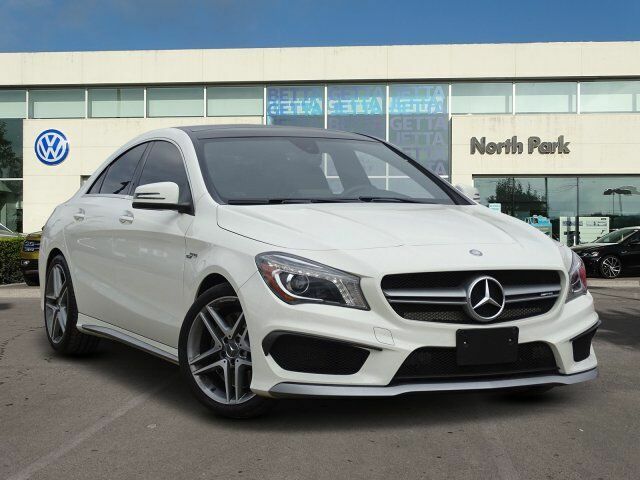 Mercedes-Benz CLA 45 AMG with Cirrus White exterior and Black Red Cut interior features a 4 Cylinder Engine with 355 HP at 6000 RPM*. Edmunds.com explains ". the CLA has a significant amount of trunk space for the class with 13.1 cubic feet, while the Audi A3 checks in at 12.3 cubic feet.". Great Gas Mileage: 31 MPG Hwy.